The second night of Big Sky games features two more contests, though on paper they are not quite as intriguing as opening night. Still, interesting basketball will be played if you are a follower of Big Sky Basketball, so let’s take a look at the games on tap. The Lumberjacks looked like a cellar dweller as little as a couple of weeks ago, but all of a sudden they are a very interesting squad. In large part this is due to the health of Gabe Rogers (as opposed to the early spark they got from the coaching change). Rogers was one of the best shooters and scorers in the Big Sky last season when he was healthy, and his addition is huge for NAU. 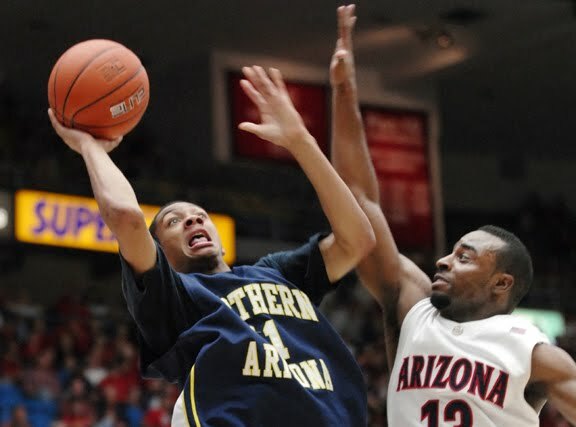 Combined with Stallon Saldivar and James Douglas, NAU has a solid guard trio. In Sacramento, there is a sense of optimism around from the 5-6 start, as they are looking for their first winning season in a couple of decades. They are a competitive, still young group, who should make this a very interesting game. The key to this game could be the production of Konner Veteto and John Dickson down low. NAU is not strong on the block, so it will be important for these guys to get their numbers. Adding it all together, I will take Northern Arizona to win a close game because this one will be played in Flagstaff. It should be very competitive, and no outcome would surprise me. At times this year, both teams have looked like solid teams, and both have looked very bad. Anything can happen in this one. This is easy the least compelling game of the opening couple days, as it features the worst team in the Big Sky against the best. Even if Weber State is not back the full strength, they still easily will have the most talent. Damian Lillard should have a big day against a porous Bengals defense, as ISU does not have any players that can stick with him man to man. If Scott Bamforth is able to get on track early, this game could get out of hand. ISU’s best chance is to slow the game down and take care of the ball. For a team with lesser talent, you either want to speed the game way up to try and force mistakes or slow the game way down to limit possessions. It is not ISU’s game to speed it up (and further, Weber is comfortable with that style of play), so it makes sense for the Bengals to slow the tempo and hope they are hitting some shots. I don’t see it happening. Look for Weber State to win big and start their conference campaign off 1-0. Anything else would be a surprise. Yep, you are exactly right, typo on my part, I will edit that. Thanks for the comment and for the nice words!